Home > Style > All > Alexander the ????? The memory of our first four people annual celebration at hotel Blue diamond is still afresh. All of those four people were seated across the table with no choice but to listen to the CEO speak. At that time my speaking agenda was different, the pockets were empty so I had to keep talking continuously for everyone to keep defocused from ordering too much. Thankfully a year later we had more coins jiggling and our bashes became more than food. They became dine and dance which continued for a few years in the Residency club. Then we got richer and graduated to Sun & Sand and later Le Meridian. Our bashes then became wine dine and dance which fit well as a part of the pub culture. Eventually, Pune city grew too small to host our indoor bashes. So we had our first outdoor annual bash overlapping the inauguration of our very own first building. The ambience of the occasion demanded a first formal annual speech by the CEO. And I dedicated the occasion to all the super stars behind Cybage. A year later, we had our 11th bash which marked a major 10th year completion milestone. And this time I devoted the occasion to all the unsung heroes behind Cybage. Our 12th annual bash that followed celebrated the most explosive growth years of Cybage that had left me, Deepak and the other directors all stressed out. A self-directed peace sentiment was being generated through a serious dose of stress medicines. Now we are finally here at our 13th Annual Bash and I have a problem. You see in the last 3 years I have finished squeezing the juice out of all stake holders, sung heroes and the unsung heroes. To top it we are steering towards a difficult year. While the stock markets continue to defy gravity, the IT band wagon has skidded onto scary slopes. On one side is the rupees’ shameless north bound march and on the other side is the very grim global outlook. And it is in this backdrop when we all are straining our eyes through the fog so thick I have been given the daunting task to present the glimpse of flickering light. So I was brooding over this challenge for the past few days when something very interesting happened. My 11 year old daughter Misha noticed stress on my face and wanted to know the reason. So I shared my dilemma with her and asked her advice on tackling the 13th anniversary speech. She said, ‘sorry papa nothing can be done, you have been beaten by the unlucky 13 bug for which exists no cure’. And I was like what unlucky 13 non sense. She said, it’s true. When even the greatest kings have been dusted in the 13th year of rule where does Cybage stand a chance. And she narrated me the story of the origin of unlucky 13. I would like to share this fascinating story with all of you now. This is a story of a great king who, a long long time ago went crusading and conquering most of the known world at that time. Around 300 years before Christ a young prince of age 20 ascended the throne of a small Greek kingdom after his father was assassinated. In a short time after assuming powers he quashed all the rebellion in his kingdom went marching far and wide. Very quickly he became the most successful military commander in history undefeated in battle. Becoming all powerful he came to his 13th year of rule and proclaimed himself as one of the gods. Ancient Greeks at that time believed in 12 gods one for each month. This king made his own 13th statue in his capital as the 13th god. And he died shortly thereafter. Greeks attribute his death to his will to become the 13th god in his 13th year of rule and ever since then the number 13 is considered unlucky. Do you know who this king was? His name was Alexander. He left behind him two timeless legacies, one, the origin of unlucky 13; and second of course, the great suffix, ‘Alexander the Great’. Intriguing story, yet it left me puzzled, the fable of unlucky 13 is fine, it’s the second fable which seems prone to hole punching. Why did history choose to single out Alexander as Alexander the Great? Surely there would have been other successful kings in the past who deserve the similar distinction, don’t you think? And then I found out it seems Alexander was a complete package deal of making some one great. There is a perfect logical theory behind it. All the characters in the word G R E A T stand for a quality that together adds greatness. For instance first character ‘G’ of great stands for GOAL. Alexander was driven by an ultimate personal goal that was inspired by his boyhood tutor Aristotle, who had told him tales on where the land ends. Alexander was obsessed to continue his victory march till he reached the end of the world. Big deal!! If Alexander’s mission was to reach the end of the world, Cybage has been driven by a goal to reach the top of the world. Haven’t you seen our ads, the balloon and the eagle over the hoarding? That is not a design mistake my friends, that signifies our goals to go up and above and beyond till we reach the sky. And our ascend continues. Last year alone, your Cybage added 500 new jobs, our newly opened info city centre at Gandhinagar has already hit a century mark and we hoisted our first flag in the SEZ zone at the Hi-tech city of Hyderabad. Let’s move on to the next character. After G comes ‘R’. ‘R’ is for RESOLUTION: strength of mind. Alexander had the resolution to take upon very powerful kings. Some of them like Darrius of Persia and Porus of India were every inch as formidable as Alexander himself. So what? If Alexander took upon the might of Porus and Darrius, Cybage since its inception has been pitted against Murti’s Infy, Premji’s Wipro and dozens of MNC’s who are several fold larger than Cybage and yet we have beaten them at annual growth rates every year and year after year. Now which is the next character in line? After G and R comes what? ‘E’!! ‘E’ is for ENDURANCE, patience. Alexander had the patience to surround his enemy forts for as long as seven days till the defense caved in. seven days that’s it? 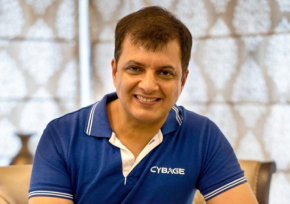 Cybage has been surrounding smallest of its customers for as long as 7 years. Ever since .com crashed many of the peers disserted their stranded customers; and our commitments have paid off handsome dividends. As a result of several MNAs last year, and the loyalty of our once small time customers, I am happy to announce 5 of the top 10 hi-tech global companies Microsoft, Google, Symantec, SAP, Dell are today Cybages’ customers. Let’s bring in next character A. ‘A’ for AUDACITY. Audacity is a very rich word that really means bravery, bravery on the cheeky side. Guts! You see you may have a goal or a resolution to backup and patience to hang in there but you still need Alexander’s audacity to succeed. Alexander was an ultimate commander in chief. Did you know he used to fight his battles in the front lines and in fact repeatedly got wounded in his wars. Well at Cybage, it’s just not the commander in chief; it is the entire operational team who fights alongside its army. How else can u explain our stupendous growth without a single specialized biz dev executive on our payroll? That’s because in our company there is no concept of back or front army lines rather all layers are hierarchy credited together in a unique model. A model we call ExelShore. That puts us miles and miles apart from any of our competitors. We still have the last character to conquer. The lonesome ‘T’ stands in the way of Cybage destiny as Cybage ‘The’ Great! The T!! Everybody ready for this? ‘T’ stands for TALLEST. You see you may have all the attributes of greatness but the greatest of all is your self-belief, your conviction that you are greatest, that you are the tallest. Alexander believed of all the low life mortals he was the tallest of all, so tall that his head was right up in the heaven with the gods. That’s it for a grand finale? Where is the challenge? It doesn’t take much to believe you are the greatest. All it takes is a little bit of attitude. Think you are a cut above, with your head arrogantly held up. Look down upon your low life competition and the greatness shall be yours. It’s so simple right? Well there is a slight technical glitch! How do we look down upon our peers? When deep down, Cybage feels honored, blessed and humbled, that we were born in an era that gave us an opportunity to rub shoulders with some other great organizations. When our feet itself are so firmly grounded in humility how would they support the tall arrogant head? We will collapse! This would prove to be very bad really. We are just this close to greatness. What an anti-climax!! I can see the dirty looks in the front row. Look Mr Nathani is dreaming to compete with Alexander the great. Alexander the great, ruthless warrior of the bloodiest wars; where entire opposition armies were slaughtered. Look at us! Do we look much like warriors? Perhaps the only war we can win is the tug of war! You know the tug of war of our school days? I happen to see one recently at my son Aneesh’s Annual day. Two teams one yellow one orange one at the side of this rope and one on the other pulling the rope with everything they’ve got for a long, long time. It seemed as though the game would never end. And finally the moment came when one team suddenly gains several yards and the game is all over. Now that is the kind of war game; that we are world champions at. Do you know the last time when we had this moment? It was during the .com crash. When all hell broke loose and our opposition was reeling and Cybage went ahead and clogged the fastest growth rate in the history. Today, my dear Cybagians we are in the same moment. When the dusk is slowly but surely descending on our industry and everyone around us is trying to get out of this mess; Cybage has a magic lamp that clearly shows the path ahead. You see the path to greatness has changed strategically slightly since the days of Alexander. The first 4 characters of the word great are fine, it’s the arrogance of Alexander to be the tallest that stands humble in front of team spirit. It’s not about commander and chiefs, personal goals or any individual’s resolutions or endeavors or audacity. This is ‘our’ Cybage I am talking about and not ‘my’ Cybage. The entire army needs to feel , share and sense the visions and goals and pursue relentlessly and fearlessly with the strength of conviction with boundless endurance. We should pull the rope in the same direction at the same time and give it everything we have got and the victory can, shall and will be ours!! The time is going to be ours!! Still chances are; history will never look back upon Cybage as Cybage the great. But you know what? Unlike Alexzander’s short instinct in greatness, Cybages’ success is here to stay. And unlike Alexander’s unlucky 13 year our 13th year is going to be a rocking one. Then may be; everyone in our little world is going to look back and remember when our Cybage was not just great but the greatest! Thank you.